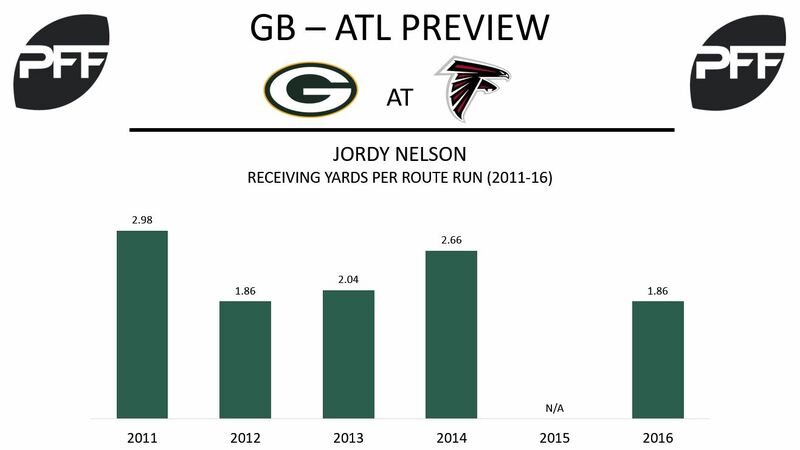 WR Jordy Nelson vs. CB Desmond Trufant – Nelson will likely be covered by Trufant for most of Sunday night’s game. Nelson registered a PFF overall grade of 79.9 in last week’s win against Seattle. He averaged 1.68 yards per route run, which ranked 22nd among receivers that saw a minimum of seven targets. Most of his routes came from the left side, as he worked to avoid the coverage of cornerback Richard Sherman. Last year, Nelson ran 62.12 percent of his routes from the right side. Trufant, who’s shadowed receivers in the past, spent 59% of his coverage snaps to the defense’s left side. Before his season-ending injury in Week 9 last season, he allowed 1.0 receiving yards per coverage snap and a catch percentage of 59.3. Last week, he gave up three catches on three targets for 43 yards and a touchdown. TE Martellus Bennett vs. S Keanu Neal – Rodgers has a new weapon at tight end in Martellus Bennett. In their first game together, Bennett averaged 1.16 yards per route run. He ran 67.6% of his routes from the slot. Neal allowed .98 receiving yards per coverage snap last week. On the five targets thrown in his coverage, three were completed for 43 yards. During the regular season last year, quarterbacks throwing at him averaged a passer rating of 85.7. 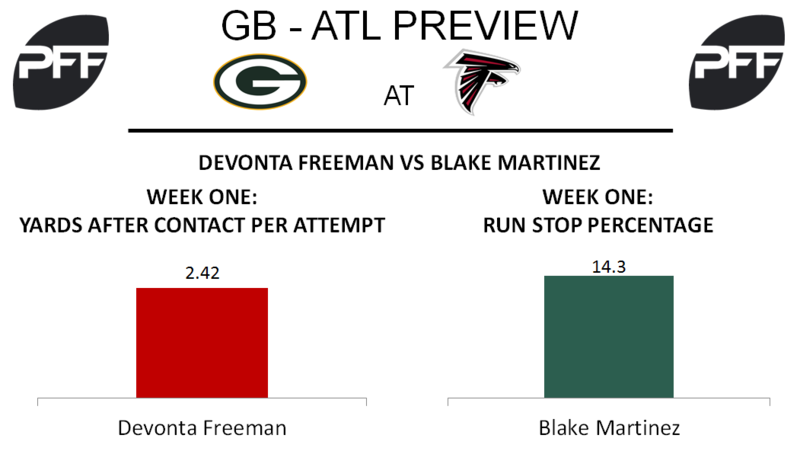 RB Ty Montgomery vs. LB Duke Riley/Deion Jones – After allowing Tarik Cohen to haul in eight catches last week, the Atlanta Falcons are tasked with stopping the diverse skill set of Packers running back Ty Montgomery. Montgomery, who averaged 1.25 yards per route run in 2016, ran 36 routes last week, including 13 at receiver. He forced four missed tackles on his three receptions against the Seahawks. Against the Bears, Falcons linebacker Duke Riley allowed all five passes thrown in his coverage to be caught for 29 yards. He had three missed tackles in coverage and allowed 28 yards after the catch. Jones allowed three catches on five targets for 11 yards. He had two missed tackles in coverage. WR Mohamed Sanu vs. CB Quinten Rollins – This week’s marquee matchup between the defending NFC Champion Atlanta Falcons and the NFC Runner-Up Green Bay Packers has many high profile matchups to watch this Sunday Night. While there is a big-time showdown looming between Falcons’ wide receiver Julio Jones and Packers’ top cornerback Davon House, the matchup between slot receiver Mohamed Sanu and slot corner Quinten Rollins could have a big impact on the outcome of this one. Sanu led the Falcons in yards from the slot in 2016 with 460 yards from that alignment and ran the most routes of any Falcons’ receiver last week with 19 routes run from the slot. Rollins lined up in slot coverage on a team-high 27 snaps last week against the Seattle Seahawks and struggled a bit by allowing 2.04 yards per coverage snap. RB Devonta Freeman vs. LB Blake Martinez – Running back Devonta Freeman paced the Falcons’ rushing attack in Week 1 by leading the team in carries with 12 and yards with 31 while scoring on a five-yard touchdown run. Fresh off signing a five-year contract extension during the preseason, Freeman turned in a modest 2.42 yards after contact per attempt average in Week 1. Second-year linebacker Blake Martinez played the second most snaps among Packers’ linebackers last week by playing on 42 out of 49 defensive snaps. Martinez turned in the ninth highest run stop percentage among inside linebackers last week with a run stop percentage of 14.3. T Jake Matthews vs. EDGE Nick Perry– Falcons’ left tackle Jake Matthews will look to keep pressure off of quarterback Matt Ryan and he will have his hands full as he will likely be matched up with edge defender Nick Perry all game. Matthews played excellent in pass blocking last week and earned a perfect 100.0 pass-blocking efficiency rating by not allowing a pressure on 33 pass block snaps. Perry graded as the second highest Packers’ defender in Week 1 by earning an overall grade of 88.5 while turning in the fifth highest pass-rush productivity rating among 3-4 outside linebackers at 17.0 PRP.